It is not true that Buhari is against restructuring – Hon…. 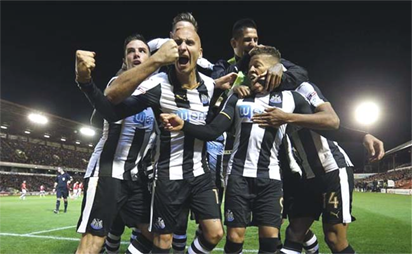 Newcastle United recorded their first Premier League win of the season with a 1-0 win against Watford at St James’ Park. The Hornets, who had won their last two matches to nil ahead of the trip up north, had the better of the first-half chances although their wastefulness in the final third stopped them from going ahead at the break. Defender Adrian Mariappa’s header was cleared off the line by Jamaal Lascelles before the Jamaica international then skewed an effort wide from seven yards out when the ball ended up back at his feet. Spanish forward Gerard Deulofeu, who arrived at Vicarage Road permanently this summer, also missed a one-on-one with goalkeeper Martin Dubravka after he was played through by Isaac Success. Newcastle, who saw Lascelles, Yoshinori Muto and Jonjo Shelvey go off injured inside the first 51 minutes, improved after the break but it was Watford who almost took the lead when Roberto Pereyra crashed an effort off the crossbar.